This is a big post. I have included all of the introductory worksheets, homeworks, and quizzes from the past school year. A lot of example problems I just make up on the fly, but I have attached quite a few word documents. Feel free to use them and adapt them as needed. Last year I reviewed estimation first. That was fine until we started dealing with very small numbers, then the students were lost. This year, scientific notation comes first. I have a three part handout that I go over in class. I make up additional problems as we go, then I hand out the worksheet. They start it in class and are expected to complete it for homework. The point of estimation is for them to be able to get order-of-magnitude answers quickly. At first, they are completely amazed that I can get within 5% or 10% of the answer faster than they can do it on their calculator. Some of them get good at this, most don’t bother even though they see that I will estimate quickly and accurately throughout the entire year. My goal is for them to realize when their answer on the calculator can be wrong and their brain can be right. It does happen and it feels good when one of them comes over to the dark side with me. The first document is the handout they get with the guidelines. I think it is rather clear, but I think I want to change the example problem near the end with the sin( ) function. They don’t know sin( ) yet and it distracts them from the operation. I expect them to use these guidelines all year long. Wow are they bad at this. Most of them almost randomly multiply or divide by the conversion to get an answer but never seem to know if it’s right or what the units should be. This is a real problem. The textbooks like to throw different units into the problems. It’s actually easy to miss, especially when the kids are struggling to learn a new concept. I’ve also found that very few of them are comfortable with the metric system. I feel like I beat this section to death, but still many cannot convert correctly. I don’t have a worksheet made up for this section. What I have done in the past is gone to an Algebra 1 textbook and copied the problems from there. I gave up on this section last year, they just didn’t have the math skills to do this for every problem, and I had to choose my battles. If they plugged numbers into equations, most of them were able to solve for the unknown. Here is the problem; the students are unaware of the key labeled EE that does the scientific notation. They also constantly miss the exponent that is shown as 1.2E33. Instead, they enter the number as 1.2 X 10 y^x 33. This works fine if all they are doing is multiplication. However, if they are dividing by the exponent, the 10 y^x 33 becomes part of the numerator. This totally screws up their answers and they have no idea why. There are two solutions: 1) They can use the EE function and only enter exponents in that form, or 2) they can use their longer form and put each term in parenthesis. Obviously, I prefer the first solution and I push them to use it. I also have them solve simple sine and cosine problems on their calculator. Not all of them use the TI-83, I don’t require it, I only require a scientific calculator. It’s up to them to know how to use it, that is why I spend time in the beginning going over the functions we will use in the course. I give them the following quiz after all of this is completed. If you have additional material, please share it. Trudi, I hope this helps. 29 Responses to "The First Two Weeks of Physics Class"
This is very similar to how I start general physics. I have found that the CPO Physics Skill Builder book has a great worksheet on writing and solving equations. How are you solving prob. #9 on the Sci Notation problems sheet? I am struggling with this one. First, you need to solve Problem #8. The volume in #8 is v=1.047×10^21 m3, so the density of the earth is roughly 5703 kg/m3. I don’t remember where I stole this problem from, but all you are doing is taking the answer from #8 and converting it to g/cm3. If you know that water has a density of 1 g/cm3, you could just divide the answer by 1000. Or you can do a conversion of kg to g and m3 to cm3. In either case, I get an answer of 5.7 g/cm3. To be honest, I don’t think I’ve made my students do these two problems the last year or two, they are just not that good at math and this kind of blew them away. What does the density of water have to do with it? Specific gravity is defined as the ratio of the density of a given solid or liquid substance to the density of water at a specific temperature and pressure, typically at 4°C (39°F) and 1 atm (14.7 psi) , making it a dimensionless quantity. Substances with a specific gravity greater than one are denser than water, and so (ignoring surface tension effects) will sink in it, and those with a specific gravity of less than one are less dense than water, and so will float in it. I am a student at OSU and will do my student teaching this spring. I was always good at math so this is not something I would have ever thought of needing to do. Thank you for providing links to the stuff you used. This is deffinitely something I will hold on to while I get started. Thanks for the great worksheets. I just had to add a section of physics to my biology load and your worksheets pointed me in the right direction to start the year. TI 83 is an easy thing to understand for students but as your said, any scientific calculator will do the work for you. I am feeling as lost as a goose, as I have never had to teach physics until this year. Thank you so much for sharing your great ideas!! Keep them coming!! This is a great resource, the sig figs worksheet is perfect! I tell the kids the rules, write them on the board, but it’s great to have something I can now tell them to keep in their binders. Thanks! Thanks so much for these resources and insights! I am teaching Physics for the first time at a small Christian school and need all the help with prep I can as I have 4 different classes to prepare for. Thank you! oh wow, are you serious that most high school students don’t know how to do this? As first i thought i can fly through this when i start my teaching but now i have to rethink my teaching strategy. I’m guessing you haven’t started teaching yet. Demographics really matter. You adjust to your student population and do the best you can. So much depends on what they had before they reached you. We had a terrible chemistry teacher that taught the kids nothing. Now we have a great chem teacher, the kids were able to review all of the two weeks worth of material in about 2 day. There are still holes in what they know, the review is a good way to see what they know, see how they work and interact, and set the tone and expectations of the class. Thanks for these. I’ll cheerfully steal them, if you don’t mind. I’ve done something similar, but with more lecturing and less individual student work. I like this method better. I will say that I do an exercise where I ask all of my students to tell me how many books are in our school library. I do it as a precursor exercise, before we’ve talked about any of these concepts. I ask them for the number of books, and tell them they’ve got ten minutes, and tell them to work on their own. Some students are completely lost, and that’s okay. Some students, though, count the number of books in a single shelf, multiply by (shelves/stack) x (stacks/row) x (rows/library) and get a number of books per library. Some simply eyeball an overall number. When we come back to the classroom, I ask them to put their numbers up on a number line, then talk to me about what they think is the “best” number. This lets me talk about both unit conversions and estimations. If there are any numbers that seem way out of line, I can talk briefly about outliers. Then I talk about my estimate. I count the number of books at a given height every fifth stack (by which I mean a vertical column of shelves). I count the number of shelves in that same fifth stack. This lets me talk about uncertainty and sampling. It usually goes over reasonably well, as long as you come back to the ideas every few days for the first month or so. This is a good idea! I might “borrow” this idea. Hey, Can anyone tell me how to do 60 miles per hour into meters per second in Unit Conversion? I finished the first page but I don’t know how to do this question. Please help, Asap. Thanks. But How do you know which one goes on top and which one goes on the bottom? for example, you put 5280 feet over 1 mile but you put 3.28 feet under 1 m? I can get the answer to these questions but it’s really just trail and error until I get the right one. The goal here is to cancel out the units as you convert. You started with miles/hour. You have miles on top and hours on the bottom. To convert, you multiply by an equality, in this case 5280 ft = 1 mile. Since miles is on top in the first part, it needs to be on the bottom when we convert it to feet. The miles on top must cancel out the miles on the bottom. If you do it wrong, then your units will be (miles/hour)(miles/feet) which would be (miles^2)/(hours*feet). But if we do (miles/hour)(feet/miles), our new units are (feet/hour). I hope that helped. If you still need help, email me directly through the contact me page of this blog. I’m trying to get away from starting physics with two weeks of math practice. I don’t want to scare them off! Not to say that I won’t be using your amazing resources! I just don’t plan to use them all at once. I’m revamping my general physics to try and accommodate a huge class for next year. Any tips on doing labs with a too big class? Thank you, thank you , thank you! This is my first year teaching and I have Physics, Chemistry and Biology. Your notes and practice problems are a huge help! Your blog is now one of my favorites. Definitely will be referencing your blog throughout the year! thanks! I am in the exact same boat as L Schoenherr. This will give me a start! The directions are great! Thanks Tr for your sharing. It is really wonderful and beneficial lesson plan for a very new physics teacher like me. I’m sure it will help the students to start physics easily. Thanks for all these tips and work sheets! this is my first year to teach physics and i am so overwhelmed. this helps so much!! Do you have the answers for your problems posted on this page? So, I feel that there may still be some steps and methods missing from this… I have a non-zero number of students who can’t differentiate between variables and units of measure. I think there’s a conceptual disconnect (which may be difficult to overcome, because it seems so obvious to us). Any thoughts? Have you ever observed this issue? I would call this a fundamental problem, but to be fair, I would link it to age and brain development. For most people, life is without units. Adults will say “I got a ticket for going 50 in a 25 zone.” Money, temperature, speed limits have assumed units because they don’t vary and so they aren’t thought about. The students who handled units the best had a strong chemistry teacher (we went through some rather poor ones over the years) and enjoy science. I made this a point of emphasis from the beginning and never let up. 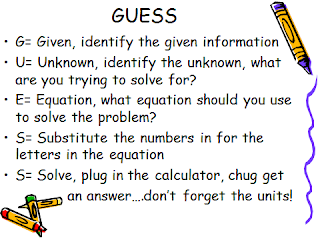 A problem without the correct units is not correct, and since students are essentially out to earn points for a grade, this helps them focus on what I deem as important. I expect every year the students are not going to know or understand the value of units unless I make it a core concept of the course. I agree Scot. I find direct instruction as well as consistency helps. Throughout the year I will include matching problems that ask what measurement is represented by the various units. They need to associate grams and kilograms with mass. The need to associate pounds and Newtons with weight. Naked numbers are not allowed. If the students are working on an assignment I will point to anything without a unit as I am walking around and wait for it to get fixed. Consistent and early insistence on units seems to help. Finally, count it wrong. I often use the GUESS method (link at the end of my comment). This is what I expect when I say “show your work”. Students don’t like it because they would rather jump straight to the calculator. Each step is worth a point. However, as problems become more complicated, the benefits increase. They are much less likely to get the wrong answer if they work it out.